Certainly, we’re in a divided age currently where the glass could look half full or half empty depending on which side of the political aisle you sit. Unfortunately, that has been true for some time now. The same dynamic is also at play in the stock market. Renewed volatility, high valuations, rising interest rates, and the latter stages of an economic recovery all worry many market participants. Yet, the domestic stock market has remained stubbornly sanguine in the face of these headwinds. Everyone wants to know where we go from here, and if it is time to get out of stocks. There is of course no way to know for sure. There are concerning signs that the market could roll over from here, but there is also a credible case for the bull market to continue. One important indicator is starting to flash a warning sign. It is impossible to watch the financial news channels or read the financial papers these days without hearing about high CAPE ratios, death crosses, or some other ominous sounding indicator. Most of these make for good stories but have not been reliable indicators of the market’s direction. There is one exception. The yield curve has been an unusually strong indicator of coming economic recessions. The yield curve is simply the yield on bonds across the maturity spectrum. In normal market environments, longer-dated bonds yield more than shorter-dated bonds. This make sense, as there is a greater risk of default and a greater risk that inflation will ensue during longer time periods. Yet, when the bond market senses that an economic slowdown could ensue, demand for longer-term notes increases and demand for shorter-dated notes decreases. This is because investors want to lock in today’s rates, which they believe could fall in the future if the economy slides into recession. 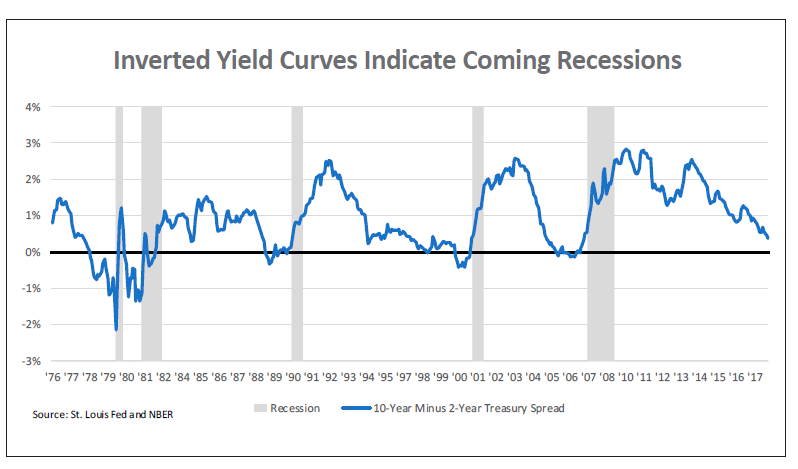 Interestingly, an inverted yield curve, where shorter-dated bonds yield more than longer-dated bonds, has had a very impressive record of predicting recessions. In fact, every recession since at least 1955 has been predated by an inverted yield curve. There has only been one false positive over that period, back in the mid-1960s. The nearby graph shows that while we don’t have an inverted yield curve currently, we could be headed in that direction. Past economic recessions have been both severe (think the Great Depression and the recession in 2008) and fairly mild (think 1990 during Desert Storm). The impact on the stock market has varied as well, but typically recessions are not good for stocks. The average monthly return for stocks since June of 1976 was just under 1.0%, but during recessionary months, it was a loss of over 0.5%. If a recession persists, a number of negative months in a row can result in nasty stock market declines. While the yield curve should be considered, we shouldn’t necessarily head for the hills. For starters, it isn’t inverted yet. As you can see on the nearby graph, the 10-year Treasury yield minus the 2-year Treasury yield has been at similar levels to today’s without subsequently becoming inverted. This was true throughout most of the 1990s, when stock market returns were some of the best on record. Also, even when the yield curve inverts, it can take up to two years for the economy to show signs of recession. The economy is quite strong currently, and even if a recession is coming, there could still be a couple years of solid returns from stocks. And, if the next recession is mild, missing out on two years of stolid stock market returns to avoid modest losses won’t make sense. There is no way to know in advance what will transpire, which is why we don’t spend much time trying to time the market. Finally, it may be different this time. The flat yield curve we are experiencing may be more because of government influences than any economic insight on the part of the bond market. The Fed bought trillions of dollars of securities, mostly Treasury bonds, to help stimulate the economy in the wake of the last recession. While it is starting to unwind these holdings, it still has massive holdings, which may be keeping long-term interest rates lower than they would otherwise be. At the same time, the Fed has been raising short-term interest rates. These two forces may be working to flatten, if not invert, the yield curve. If an inversion happens because of government influence rather than free market forces, it is possible we won’t see a subsequent recession. No one wants to go through another downturn like we experienced in the early 2000s or in 2008. It therefore seems reasonable to want to protect assets by becoming more conservative. However, it isn’t that simple. For example, timing the market is an imprecise art, even when stocks appear overvalued and reliable indicators are flashing ominous signs. Numerous studies show that market timing is a fool’s errand. Also, selling out of stocks, particularly after a ten-year bull market, can result in quite a hefty capital gains tax bill. And, what if you’re wrong about the market’s future direction. Imagine trying to time the market by selling out, paying significant capital gains tax on all the earnings of the past decade, and then finding that you were wrong as the market continues to move higher. That is a real possibility in today’s environment. Besides, what seems like credible evidence to the contrary, there is still a reasonable case to be made for stocks to continue their march higher. Robert Shiller, a Yale professor and Nobel Laureate, devised a valuation metric that has been widely adopted by the financial community and financial media. It effectively boils down to taking the price of the S&P 500 and dividing by the average earnings of S&P 500 companies over the past ten years. This is essentially the same as using the P/E ratio, but it smooths the ups and downs in valuation figures by removing short-term earnings fluctuations. Shiller calls his metric the Cyclically Adjusted Price/Earnings (CAPE) ratio. Using the CAPE ratio, the stock market’s valuation surpassed that of the 1929 peak, and recently traded at the second highest level on record (see nearby chart). The Dot Com bubble is the only period since the late 1800s where valuations were higher. This has set off a rash of speculation that the market is on a path toward a large decline. 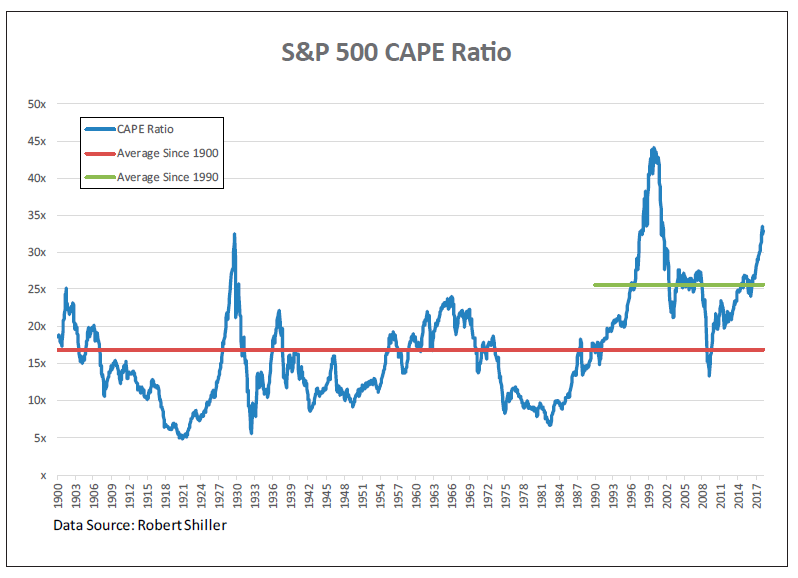 However, Wharton professor Jeremy Siegel has shown that the CAPE ratio may overstate true market valuation because of changes in the way S&P 500 earnings have been calculated, as well as other issues. Additionally, and a fact that we believe has largely been overlooked, now that there is a new tax regime for corporations, it may be that historical, earnings-based measures of stock market valuation are even less relevant for forward-looking purposes. When we did our own analysis, making two simple adjustments to earnings based on these issues, we find that a reasonable case for further stock market appreciation can be made. The first adjustment is to pick up on professor Siegel’s point that S&P 500 earnings during the Great Recession were unfairly penalized by insurance company AIG. The bust in AIG effectively wiped out the earnings by every other company in the S&P 500. However, to say that the entire S&P 500 had near-zero earnings overstates reality. Siegel’s “The Shiller CAPE Ratio: A New Look” published in the Financial Analysts Journal in 2016 presents this case in much more detail. In order to adjust for this abnormality, and recognizing that the impact will roll out of the current CAPE calculation in roughly 18 months as the ten years’ worth of earnings in the calculation rolls forward, we recalculated the current CAPE ratio, but started averaging earnings in December of 2009 rather than June of 2008. We then applied a 5% annualized growth rate to Robert Shiller’s current earnings figure for the remainder of 2018 and 2019 to come up with 10 years of earnings. Bear in mind that consensus earnings forecasts are currently for close to 10% annualized growth between now and the end of 2019. The second adjustment we made to the earnings data was to reflect the new tax law. With the corporate tax rate now at 21%, versus a previous high rate of 35%, earnings should theoretically be higher going forward. Accounts we have read speculate that aggregate corporate earnings could rise by 10%. Accordingly, to reflect this impact, we adjusted historical earnings by 10% to come up with a pro forma of what they would have been if the tax law had been consistent over the past ten years. These adjustments reduce the CAPE ratio from today’s reading of 32.1 times average earnings to 24.6 times earnings. Certainly, there is a lot of room for a more thoughtful and rigorous analysis of the adjustments we propose, and there are many other factors that will impact the stock market going forward. However, there is a reasonable case to be made that stocks are not as extremely valued as most headlines suggest. In fact, if our adjustments are accurate, the stock market currently trades below its average CAPE ratio since 1990, which is 25.6. If one assumes that today’s raw CAPE ratio of 32.1 is a level at which the market could trade, and using our earnings adjustments, this implies the S&P 500 could rise to 3,550 or 30% from its current level. A rise of that magnitude is certainly not the consensus, but it is mathematically reasonable for the market to continue to earn significant gains. The stock market often moves contrary to consensus forecasts. In the face of many stock market naysayers, there is a reasonable argument for a path toward further gains. Truly, it is the best of times and the worst of times for stock market investors.